First off, addressing the rumors that I have Soo many toys that I seem to have misplaced my entire Justice League is just that, Rumors! I keep finding cool toys in unexpected places. Like today, the plan was to go to Toys R Us after some clothes shopping at the mall. Instead we found Sinestro, Kyle Raynor, and Vixen all sitting on a rack full of Justice League toys at Mervins. What the heck? Mervins, a mall store, had a better toy selection then Toys R Us, Target (which owns Mervins I think?) and Walmart. What is the world coming to? 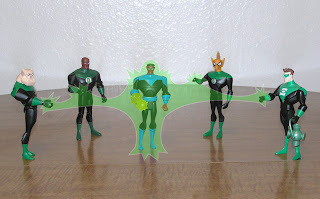 As soon as I introduced Sinestro into the collection the Lanterns attacked. They really don't like him. I don't like him either. 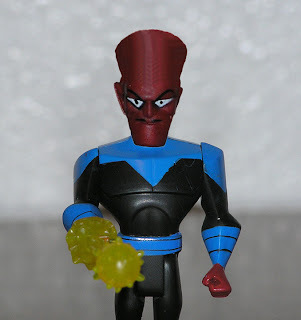 I wish they had gone with the Bulbous head approach which was more familiar to the Super Friends days. Oh well. Now back to Benji in the Wild on TV tonight! There's a five star adventure! 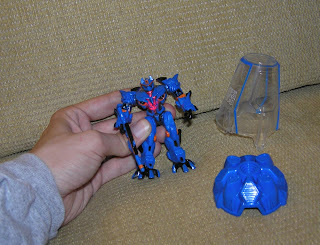 A few weeks back I bought a couple Transformers Real Gear toys. Mainly because the store had a buy two get one free sale. I was already going to buy that GI Joe Flint figure, so I figures, get another toy, get another another toy free. A few weeks back back, I bought a Dreadrock figure. 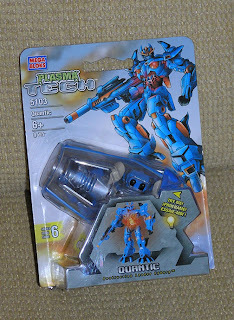 This was my first real super nerd purchase of a Takara version of the toy from Japan. 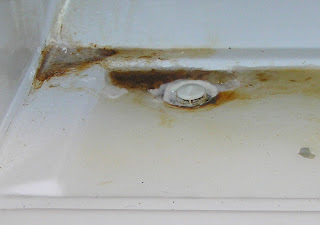 I was hoping he would have some sharp edges or extra lead paint that America's versions are supposed to weed out. As of late though, who knows. Just keep licking the Batman dan. A few years back back, When Transformers Cybertron toys first came out, Jetfire was my top pick, but I never bought one. I was really bumped out when I saw him on ebay for crazy inflated prices. 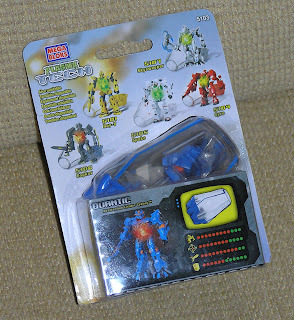 Strange that Dreadrock was only 11.99 on ebay and its the same thing right? SO his sound effects are in Japanesse. How could you tell that differance? 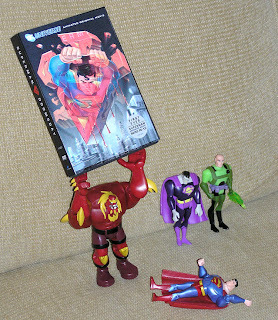 Superman Doomsday DVD movie (spoilers) and First Ever post rated PG-13. I find it Bizzaro how this movie's release went right under my radar these past couple of weeks. 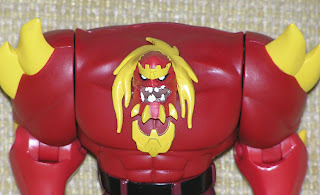 I have purchased two Doomsday figures on good sales of late, and was really curious of the whole Doomsday story in the Superman universe since I missed it in the 90's. I was reading Wikipedia stuff, and asking friends how it all went down. I was trying to borrow a copy of the comic from a friend who then tipped me off about this being released yesterday. So I got a copy on the way home from work and all things are now answered. Well at least most things. I'm sure the comic is different, but I can now say I lived through a Doomsday episode of Superman. It was an okay movie. Nothing to drop someone through the atmosphere about. Had some really nice animation momments. The usuall gee whiz Lois, you can sneak into Lex's building but still be doofed by Clarks glasses. SPOILER: This movie is sort of taken loosely from WB's Superman the Animated series. Some characters are drawn different, different voices etc... but still feels close to the same story line. Its a bit discombobulating to see Lois Lane drawn like Lana from Smallville. Not sure why they did that? Also, Insert Geeky voice here, innnn cartooon epissooode 27.5c Lex creates a clone from Superman who then turns out to be Bizarro Superman. Well in this movie he does it again, which was sooo played. I'm not a big Lex Luther fan so when he showed up yet again to take away the thunder of the Doomsday plot, I was a bit bored. The only time I really like Lex is when he insanely heads the Legion of Doom in Darth Vader's head. Proably because when the Legion of Doom is around so is the Justice Super League Friends, and at that point there are so many characters running around there isn't room for boring Lex Luther propaganda. Then there is my favorite Spiderman episodes with the Tablet of Time and the Sinister Six, and I really think I lost my train of thought which I believe Superman just ran faster than and jumped over. In short, its a better renter then buyer DVD. 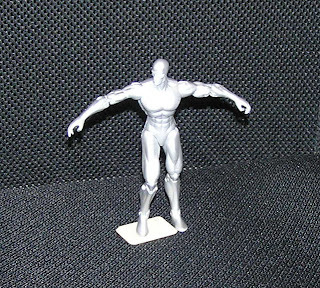 Now I just need to figure out why the two Doomsday figures I own are red instead of grey blue. 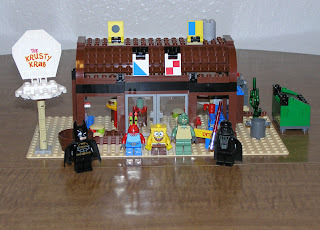 Sponge Bob Legos, and Darth Vader, and Batman. 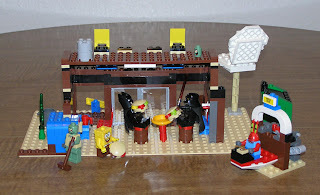 Things got to an okay start, not much seating available so the Dark Lord of the Sith had to share a table with the Dark Knight. Two Krabby Patties were served. Things just got ugly from there after dinner. 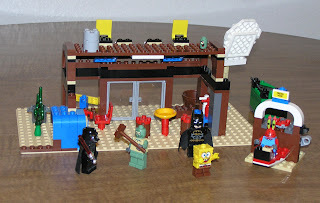 Darth attacked Squidward over high prices, and Batman just wanted to chase Sponge Bob. Oh God what is that?!!! Don't you remember my first post with Space Suit Leo? I cleaned up that mess squeeky clean, but two years later, it has started to return. I wonder what it is? Maybe Clayface in a couple more years? 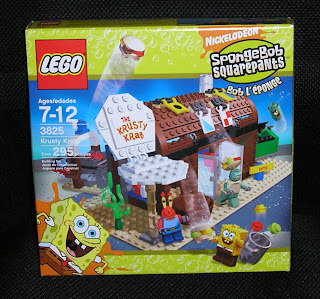 I bought some Sponge Bob Legos for the special occasion. 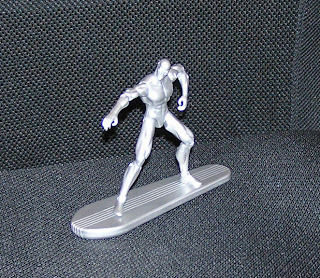 After a few months of light surfing through the stores, I found the Silver Surfer to annoy my Fantastic Four toys. 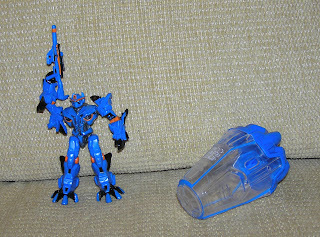 I was a little disappointed with this toy's display base though. Its a little oversized don't you think? Almost the same size as the toy, How rediculous! Luckily I have a few old GI Joe bases to spare. That looks much better. Stare at Doomsday uninterupted for ten minutes, then in thirty words exactly, tell him why he shouldn't kill you. 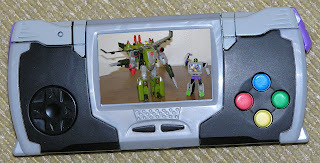 These new Mega Bloks toys look strangely familiar. I can't think of any other toy line that involves crashing into the planet in a little pod like form? This guy is named Quantic the Destruction Leader Cyborg. (I think the light up inside is 'plasma' which is his living part) He sure reminds me of something. Bogkov, the grey one, better not go near Megatron. Same with Roy-V, the yellow one, would be wise to stay clear of Bumblebee. Can't figure who Quantic looks like. Good thing he is evil? By the way, these toys look cooler than they are. Really wish I had my 4.49 + tax back. Got to love the discount toys! I keep hearing that the discount stores in towns, like Big Lots, or others have all sorts of cool cheap toys, and or knock offs of Transformers. Thought I would check that out last night. 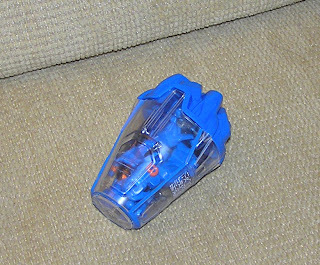 I did see some funny Transformers knock offs, like a large sized Beast Wars Rat trap, a Beast Machines Optimus, and some other funny ones. They were REALLY cheap, but I don't have no room so I passed. Just thought it was funny to see. Then I came across these cheaper army guys. 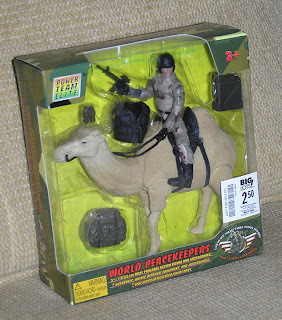 I'm looking for something neat to accomodate my 25th Joes. They didn't have the knock off AWE Striker I have been looking for. 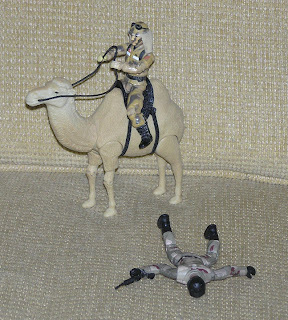 But they did have this Hilarious Camel trooper! As soon as I took it out of the package, Dusty attacked and took over ownership though. He totally fits though. Now I'm tempted to buy more camels. They had a horse too, but it wasn't as funny.